Save this date in your new Diary and make all your 2018 resolutions of being more organised, making more time for yourself and growing your business a reality. 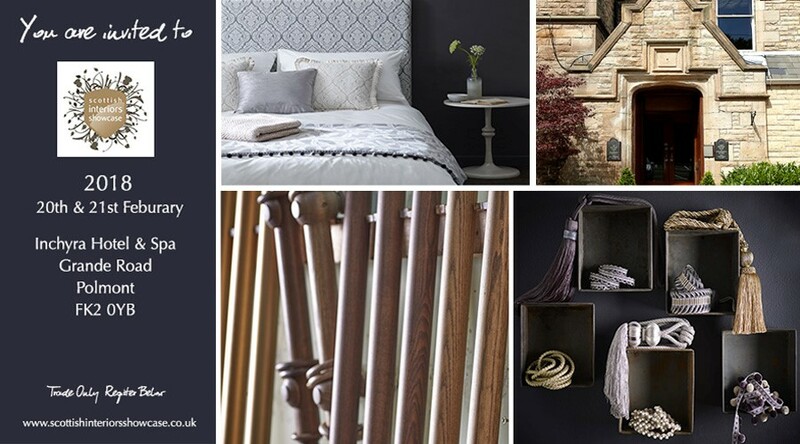 Scottish Interiors Showcase 2018 is a trade-only event showcasing the latest collections from some of the best suppliers to the Interior Designer sector. The show offers a fantastic range of exhibitors to trade customers, showcasing the latest in fabrics, finishing accessories, flooring, and lighting often ahead of the London launches. This event is not to be missed! We will be showcasing our latest Pole Collections, Fabrics, Tracks, Tiebacks & Trimmings so come along, get some inspiration and get those creative ideas flowing for the year ahead. Simply register your company details Here for free entry on the day. Scottish Interiors Showcase 2018 will be the show’s 11th successful year and sees it relocate to the fabulous Macdonald Inchyra Hotel & Spa. This fantastic venue is just 20 minuets from Edinburgh airport, yet nestled within the extensive and serene estate grounds of an idyllic location in the heart of Scotland. This hotel boasts a magnificent, state-of-the-art Vital Health and Wellbeing Spa plus, an award winning Scottish Steakhouse. Feburary is the month of love, so come and share our love for texture, colour and interior décor. Or just swing by after a romantic weekend in Scotland, either way we will see you there!